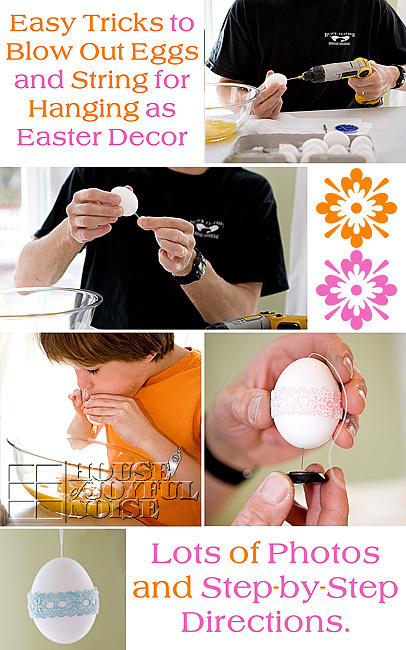 How to Blow Out Egg Yolks and String for Hanging | Decorative Eggs for Keeps. 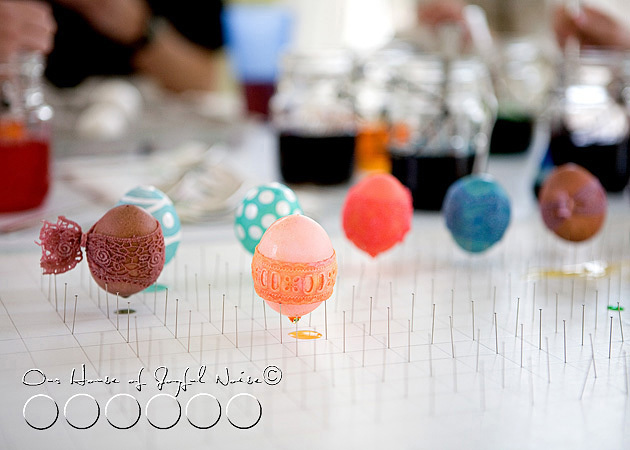 A couple of pre-Easter seasons back, we blew out and decorated eggs, and prepped some for hanging. 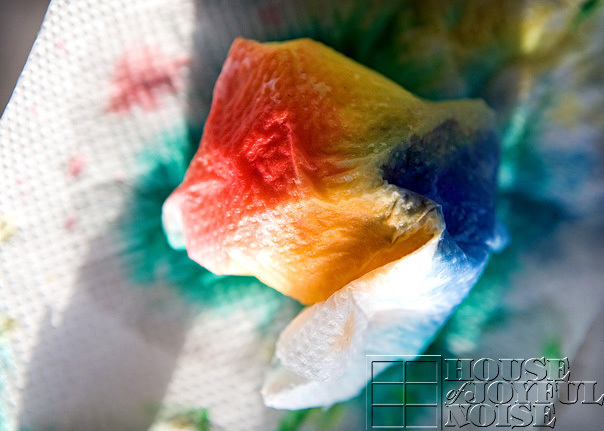 I took lots of photos of the process of the way we did it, but never blogged it for you all. It’s not all that hard. 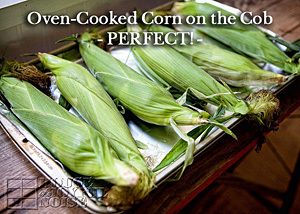 And the best part is, you don’t have to figure out what you’re having for dinner that night! 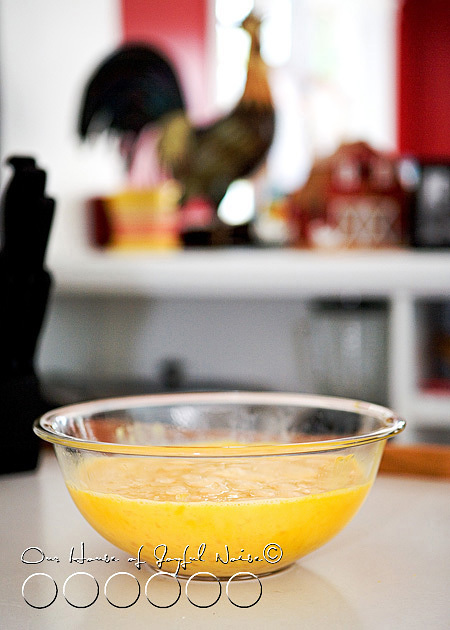 You’ll have a bowl full of egg yolks, ready to scramble. : ) Breakfast for dinner! We do that sometimes around here. 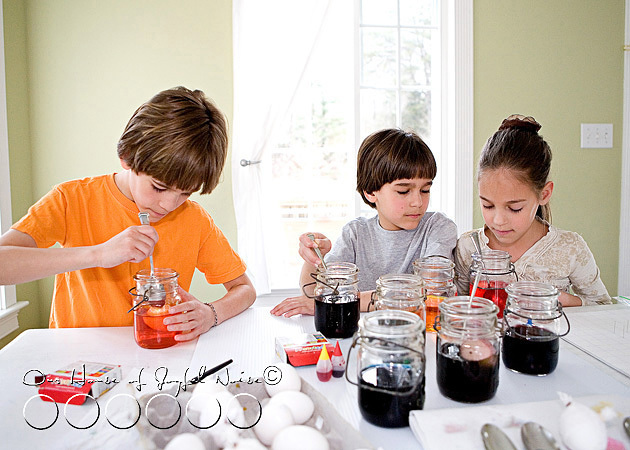 Scroll down to read and see just how simple it is to blow out eggs, and string them for hanging after decorating them. When you’re done reading through, the above collage is the perfect Pin It image for these tutorials. 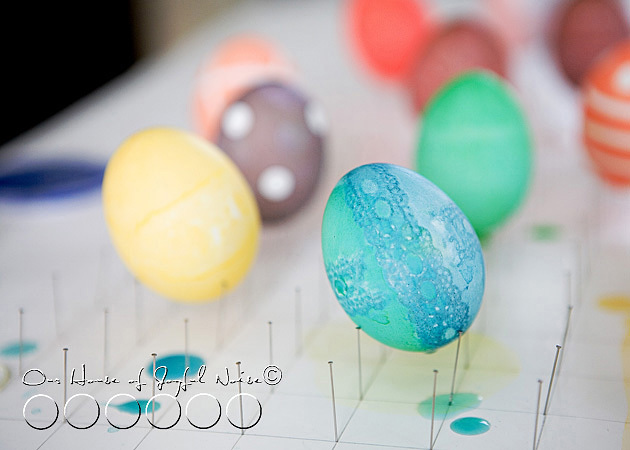 So let’s pierce some eggs. 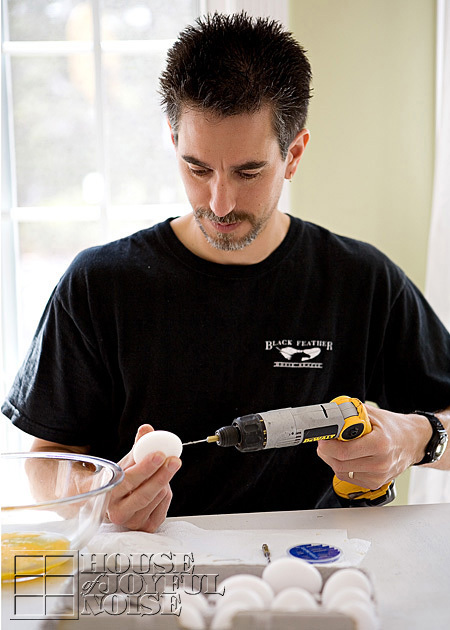 Using a drill makes putting the holes in the egg very easy. 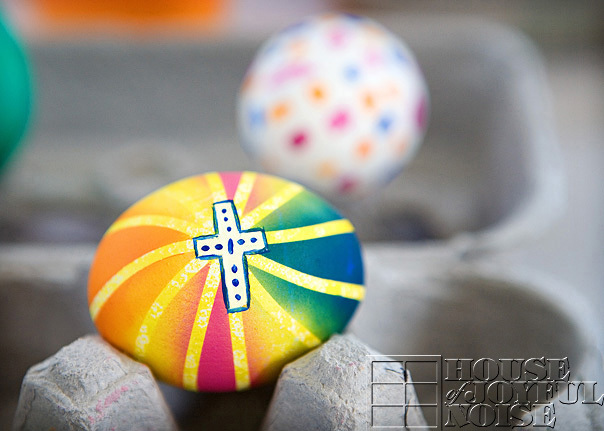 Use a 1/16 drill bit for the top of the egg. This is the smaller hole. 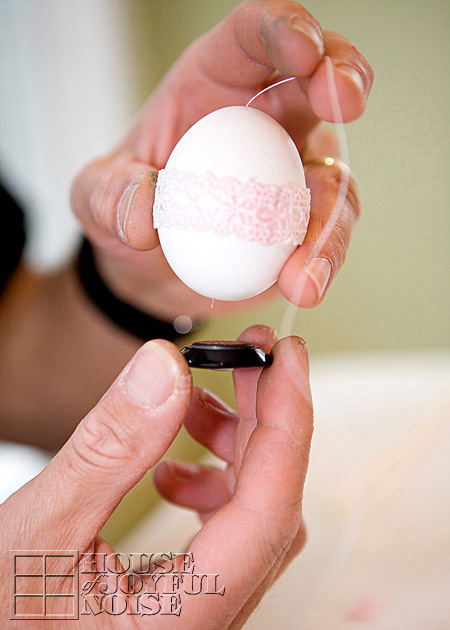 On the bottom of the egg, make a slightly bigger hole, using the 1/8 drill bit. 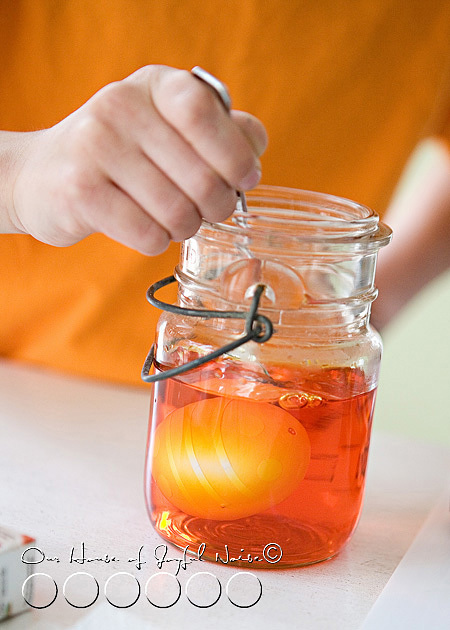 Next, use a long pin in the bottom/big hole, and move it around and jab in and out, to break up the yolk sac some. 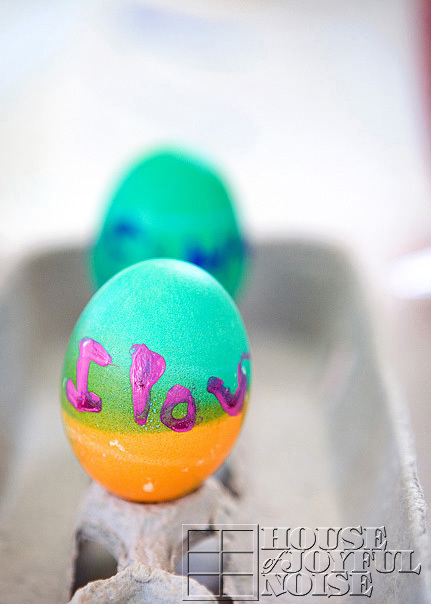 Now it’s time to blow that yolk out. We let the kids take turns blowing them out. They thought it would be so fun. But I was worried their head would explode, seeing how red their faces were getting! I was like, “Oh my gosh! Breathe!” Ha ha ha. It took them a little bit to learn how to direct the air from their blow, into the hole. You need to do that best you can. 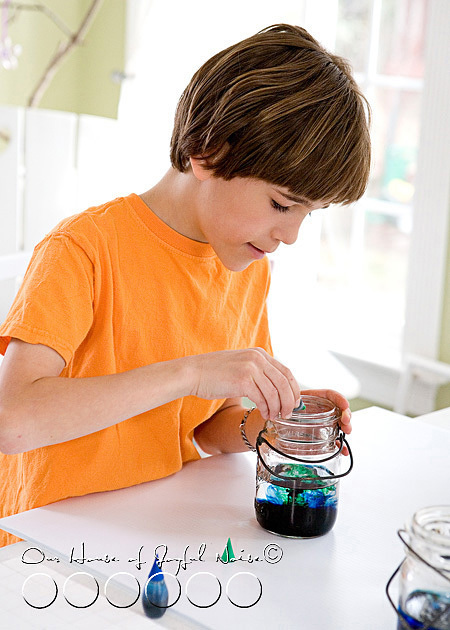 You can also try a syringe, to push air through. Once the yolk starts coming out, it comes out pretty fluidly. Plenty for our family of 6. 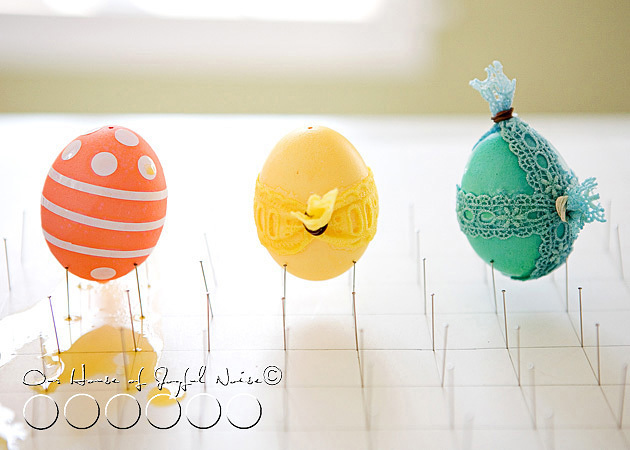 Now you can decorate them. 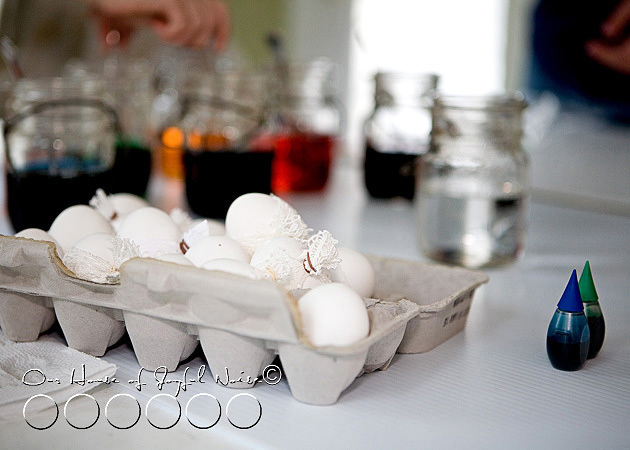 It is a little tricky to dip-dye the hallowed eggs, because they tend to float now. 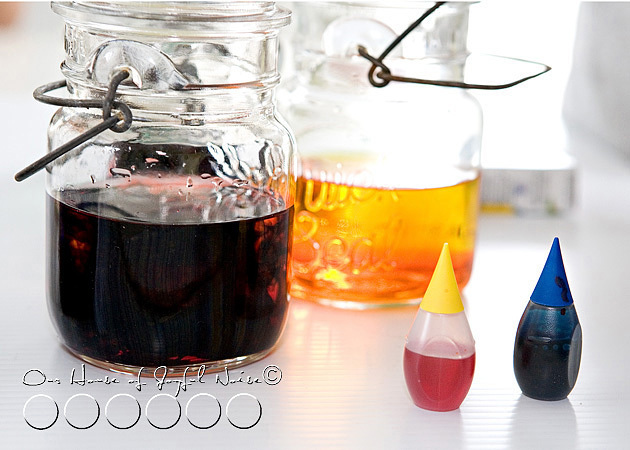 So if you are dyeing them, you’ll need to keep it submerged with a spoon or whatever. 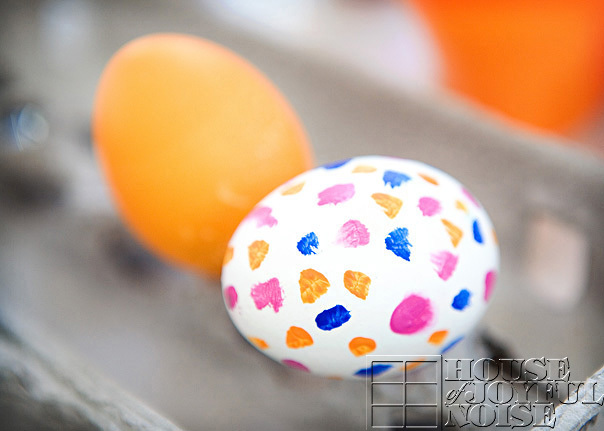 Of course, there is a host of other ways you can decorate eggs. 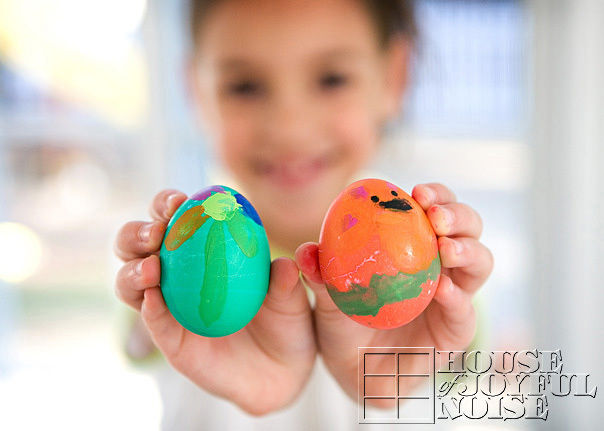 And remember, since these are blown eggs, you’ll be able to keep them! 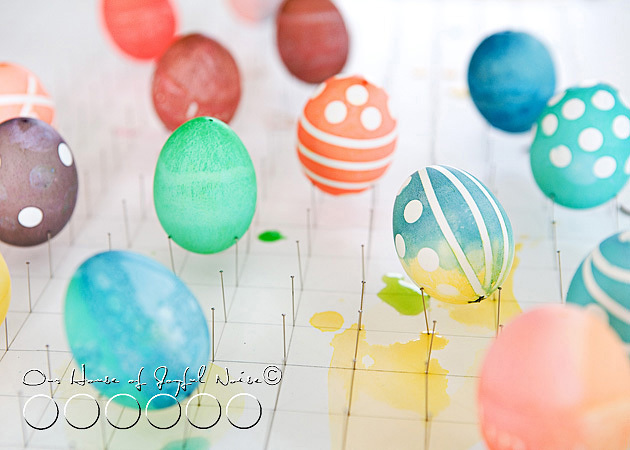 So consider drawing on them, doing a little decoupage with dried flowers, using Washi tape, or embellishing them in a number of ways. Just use your imagining and have fun. small (wire) cutters. As you have probably caught on by now, my husband was the executor of this project this day, while I was the photographer. 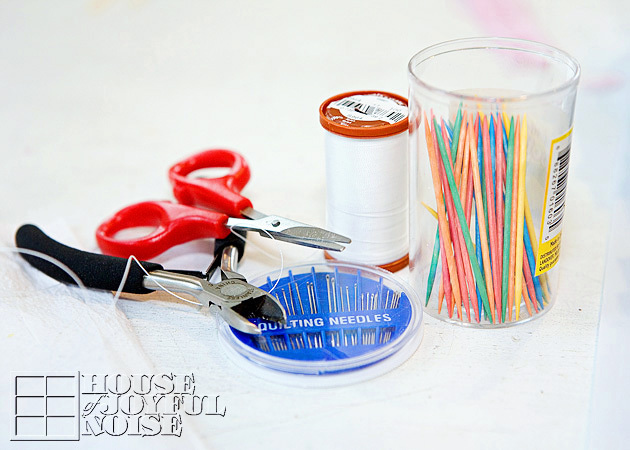 Thread one of the larger sized needles, and tie it off as a single thread. 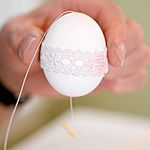 Insert the threaded needle in through the top of the egg, all the way, but leave plenty excess out of the top for hanging later. Now it needs to come out the bottom, and as you can imagine, it would be challenging to make the needle do that. So here’s the trick . . . . . 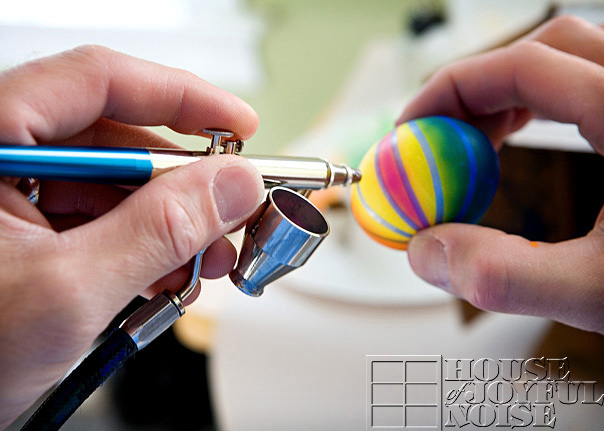 Hover a magnet underneath the egg at the hole. 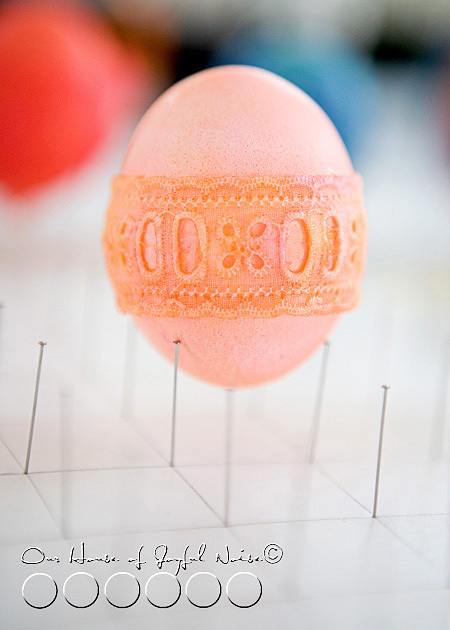 You can gently shake the egg as you do this, to try and get the tip of the pin to the hole as well. The magnet will draw the the threaded needle down out of the hole. Cut the pin off the thread now. You won’t need it anymore for this egg. On the same end of the thread that you cut the pin off, tie on a toothpick, and wrap the thread around it, as shown above. 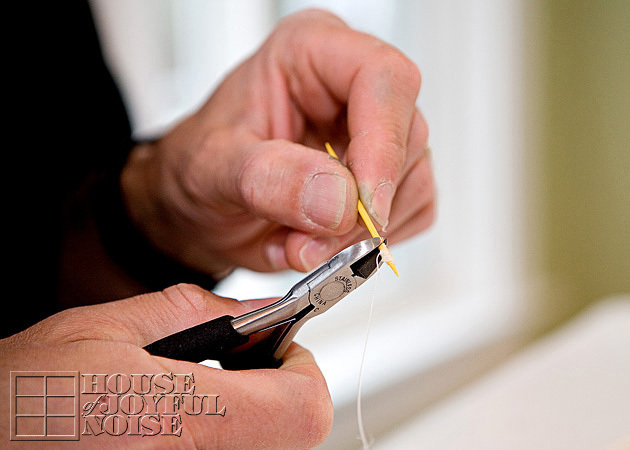 You only need that little piece of toothpick where the thread is wrapped, (maybe 1/2″ or a little more) so you can cut the rest off using your cutters. 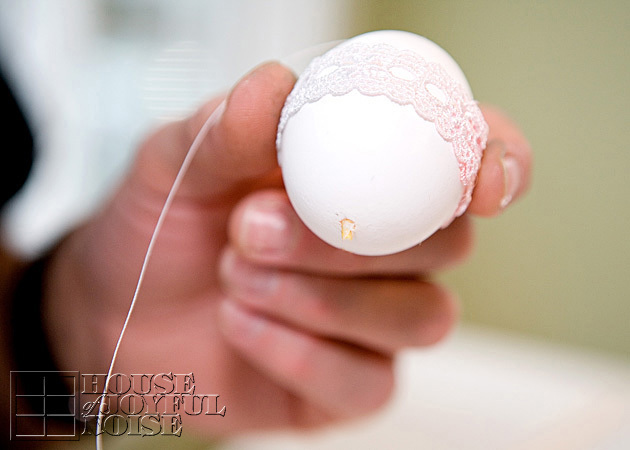 So now you have this little piece of toothpick, tied onto the thread, that is coming out of the bottom of your egg. 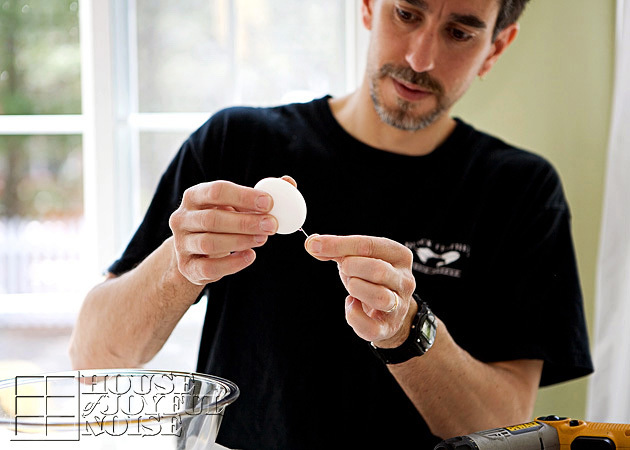 Now carefully push the whole thing back up into the hole of the bottom of the egg. Let it fall in all of the way. 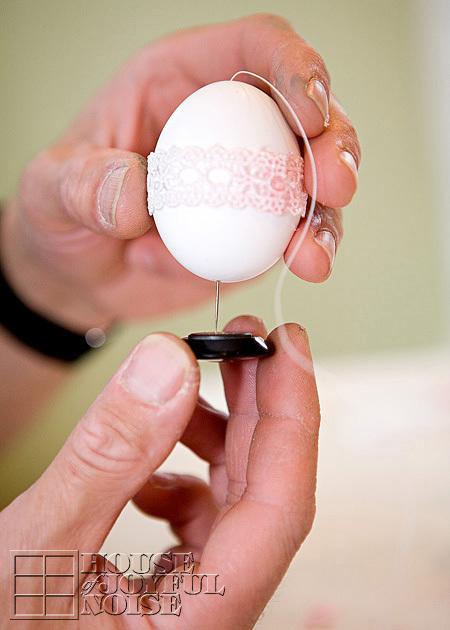 This will act like an anchor inside the egg, for the string coming out of the top of the egg, to hang it. 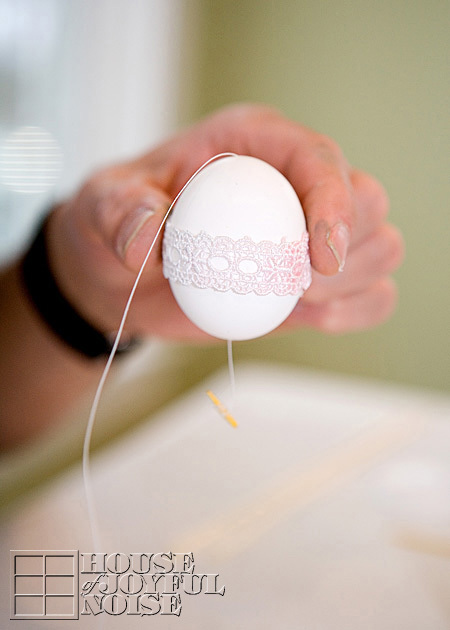 So with the single thread coming out of the top, tie it in a loop, to hang your egg. 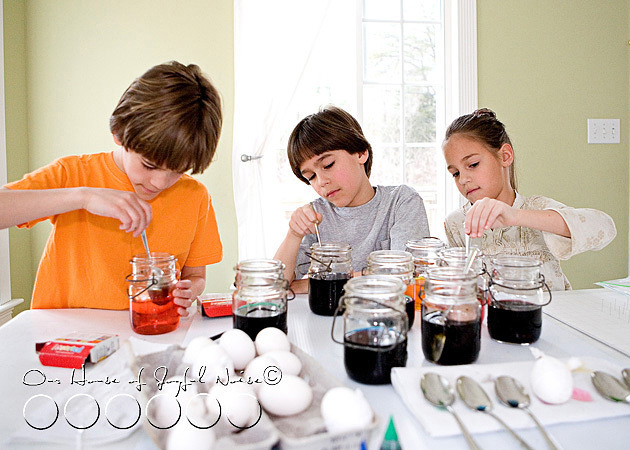 That is the process you do with all of your eggs. 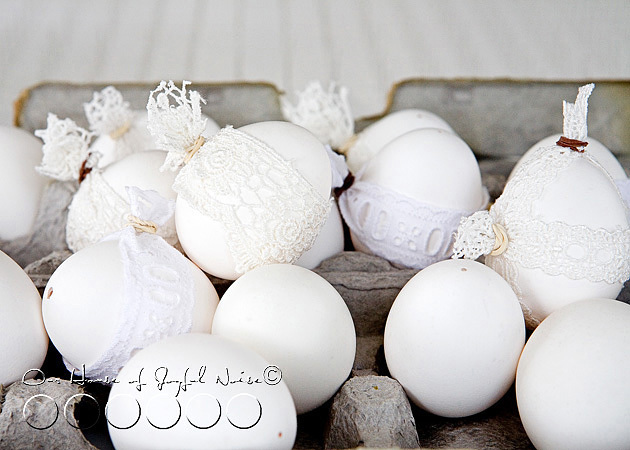 If you don’t wish to hang some or any of your eggs, of course you won’t need to string them. 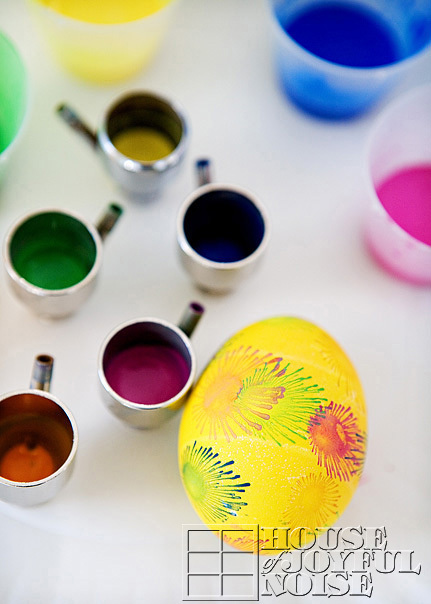 All of it is fairly quick, and you’ll have your beautiful decorated eggs for years to come. 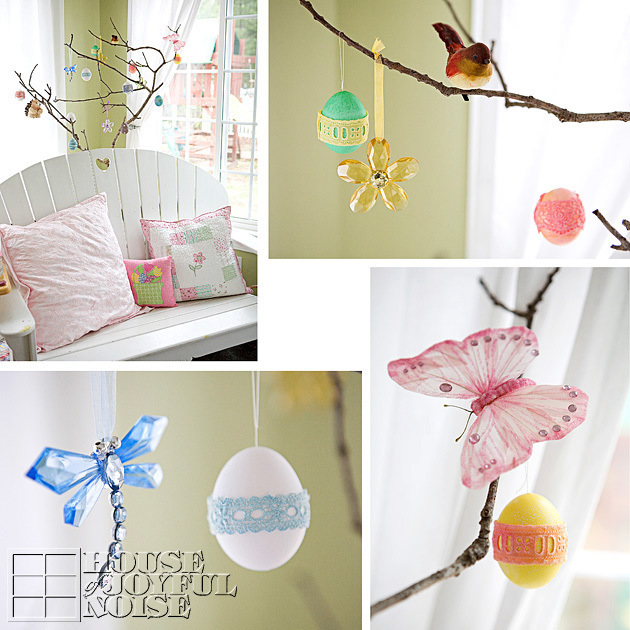 Hung on an Easter Tree. 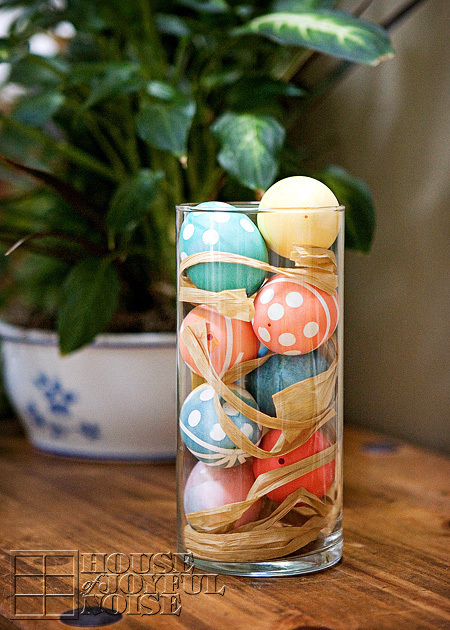 In a glass cylinder vase, with some pieces of Raffia paper. What ways will you use yours? 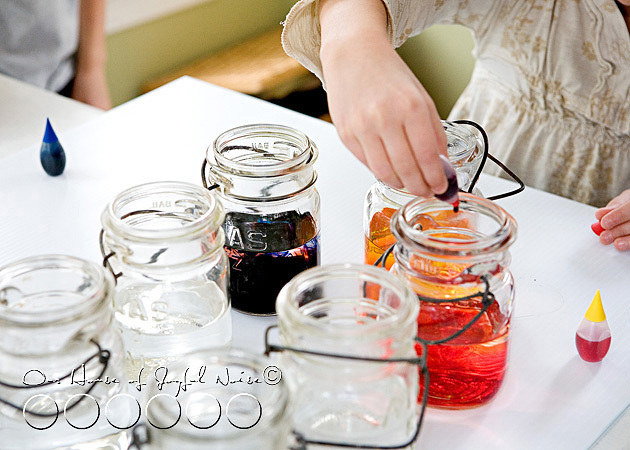 I am considering making some more this year, decorating them in a new beautiful way, possibly personalizing some, and giving some of them as gifts! 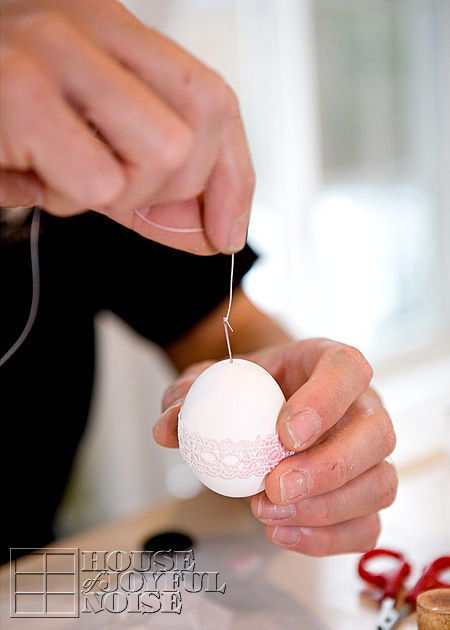 We hope you found this tutorial helpful and learned some tricks that will help you blow some eggs of your own, and maybe string a few as well. Thanks for coming by! 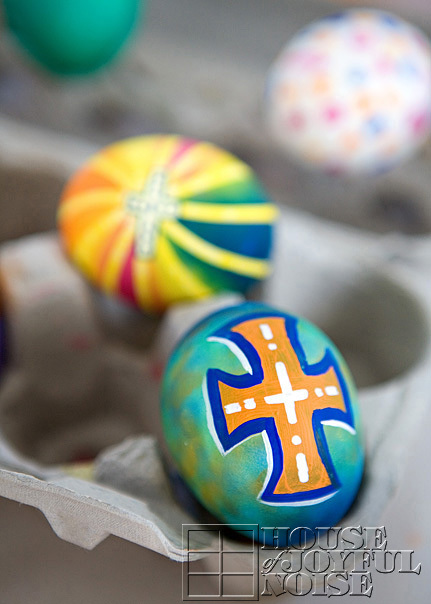 May your Easter celebrations with those you love, be beautiful! 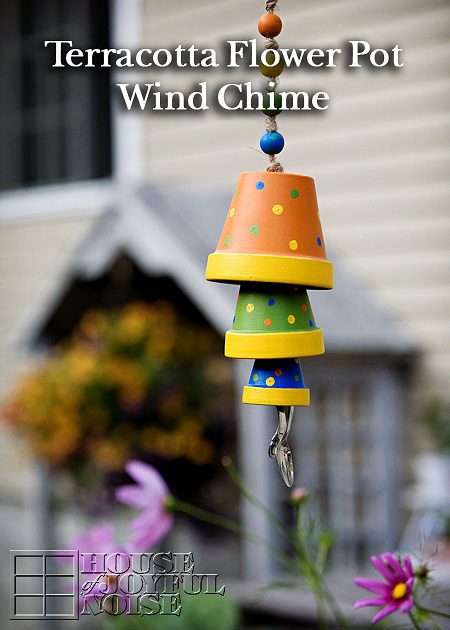 This tutorial was shared at Joyful Homemaking’s Think Tank Thursday Link Party #230! 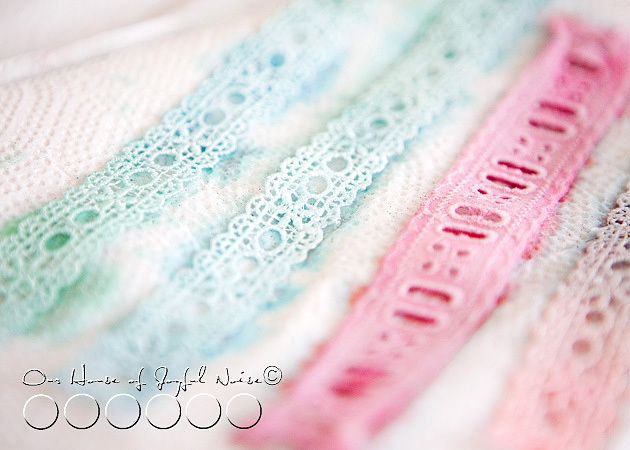 I find spring-time to be such a craft-inspiring season. Although winter & spring has been taking turns around here in the past few weeks, I still like to think of it as just spring, as it should be. 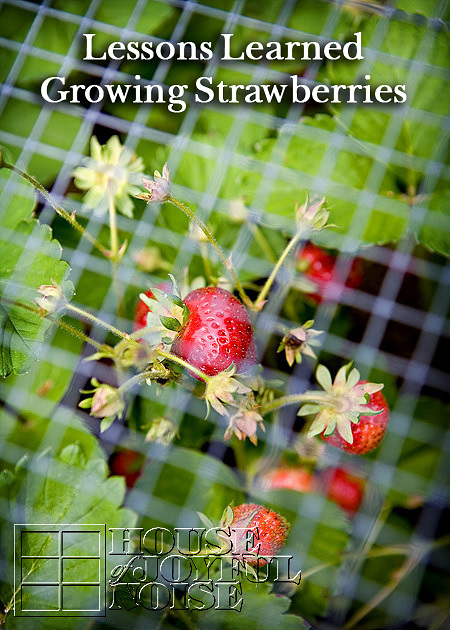 Time for garden planning, enjoying the new warmer, sunnier days, and looking for those very exciting signs of spring. They are popping up all around us, despite the occasional surprise snowfall! 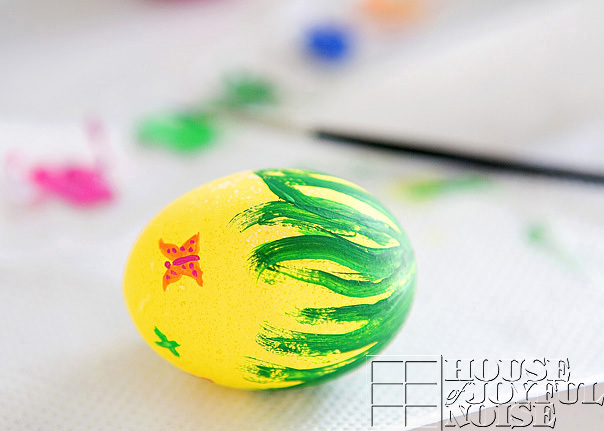 With spring comes all kinds of cheery colors and symbols always associated with this season of new life. 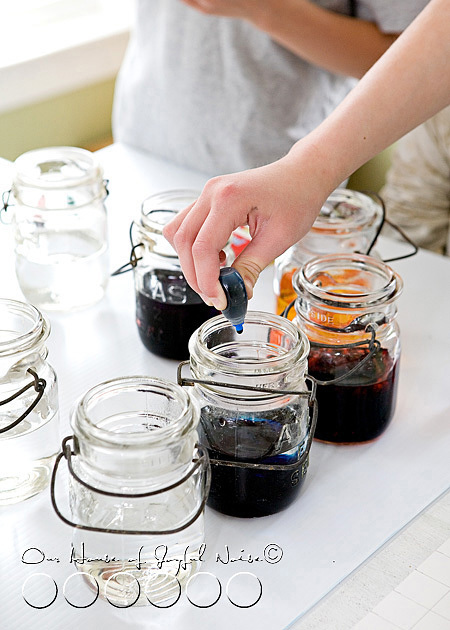 It just makes me feel like crafting! 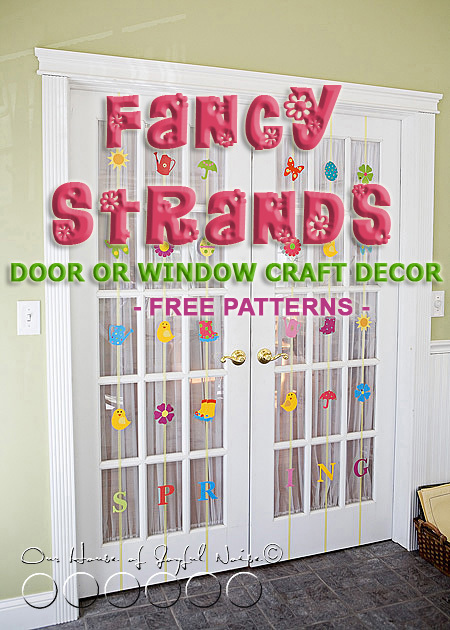 This is a craft you can do with ANY kind of doors or windows in your house! 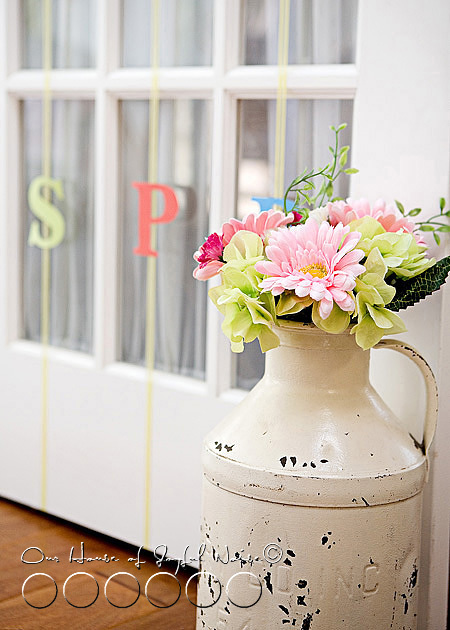 The French doors between our sun room, which is always bursting with sunshine or a soft natural light, and our living room, has been the focus of my craft quite a few times! 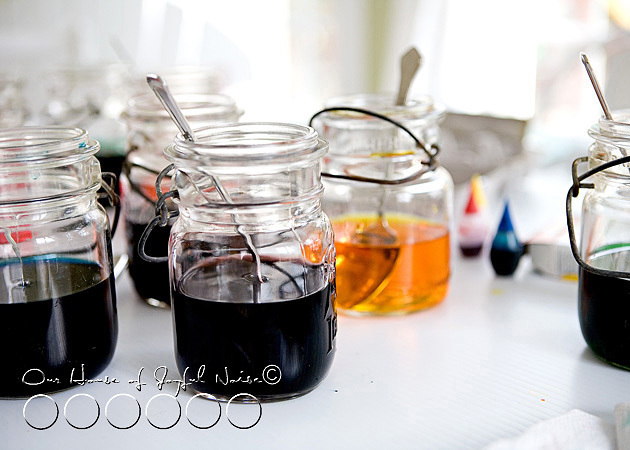 All of the rectangular panes of glass strike me as mini picture frames, calling for some little artwork. This past Winter, I made beautiful sparkly snowflakes on blue ribbon, which is a craft I am saving to share later this year. 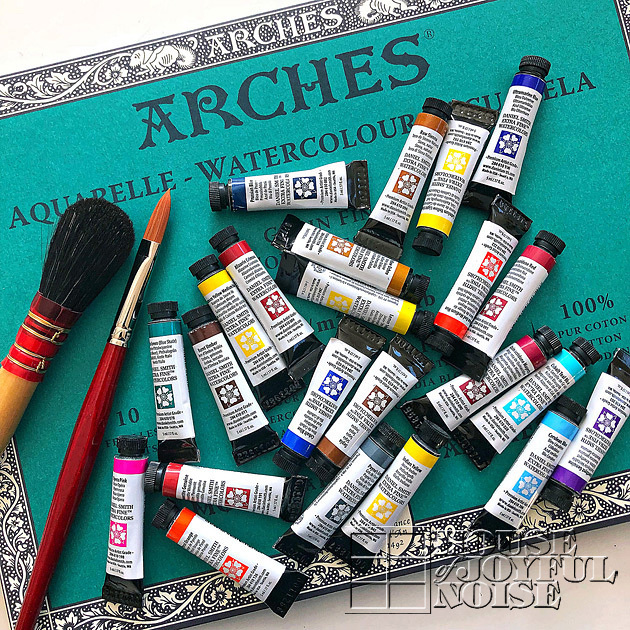 There was a functional twist of an idea I used with them, and I think some of you will rather enjoy using the idea for yourselves next year, when I’ll have the opportunity to share it with you in time to use the idea. 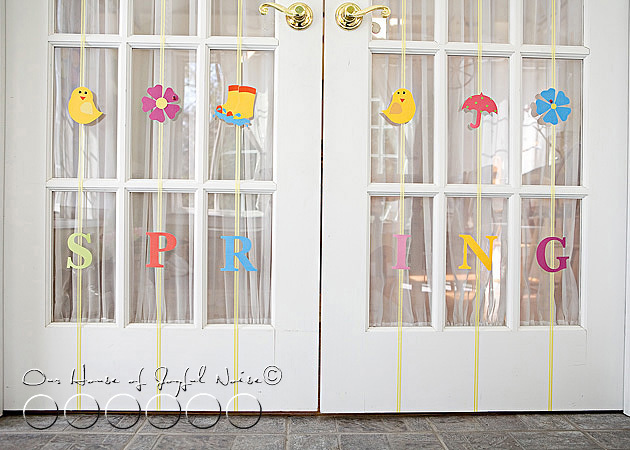 My craft idea for Spring is very similar, although strictly and adorably decorative, using very simple Spring shapes, ribbon and colorful card stock. 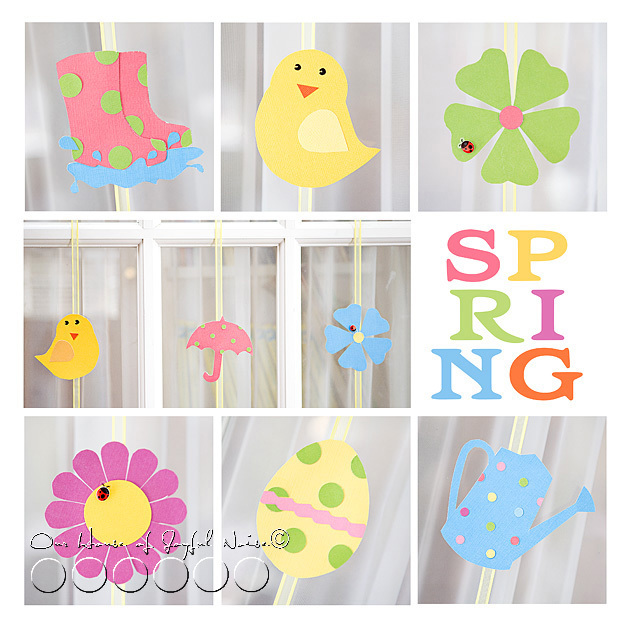 I designed a small collection of Spring Shapes in Photoshop, to use as stencils again and again. I will share these with you by the end of this post. But here is a peek at what I came up with. *Any little embellishments you like. 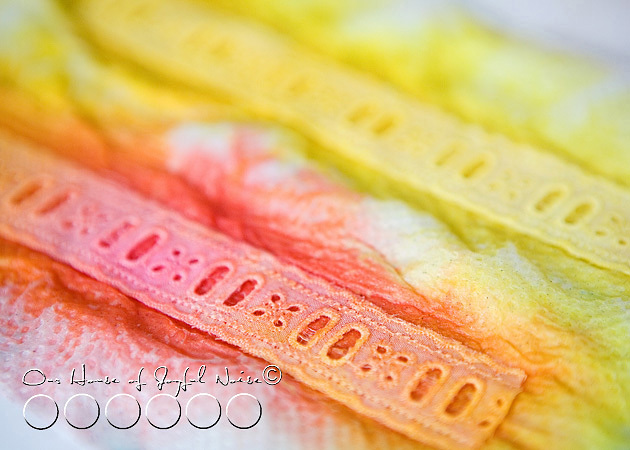 I found this block-pad of linen card-stock in beautiful colors, at the craft store. 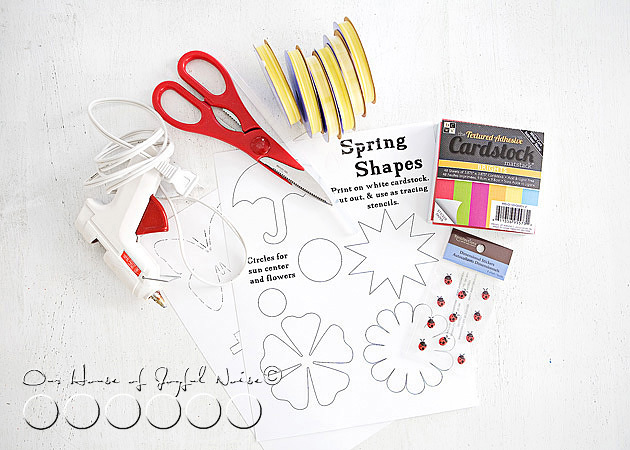 I knew it would be perfect, to use for my Spring shapes, that I wanted all relatively the same size. 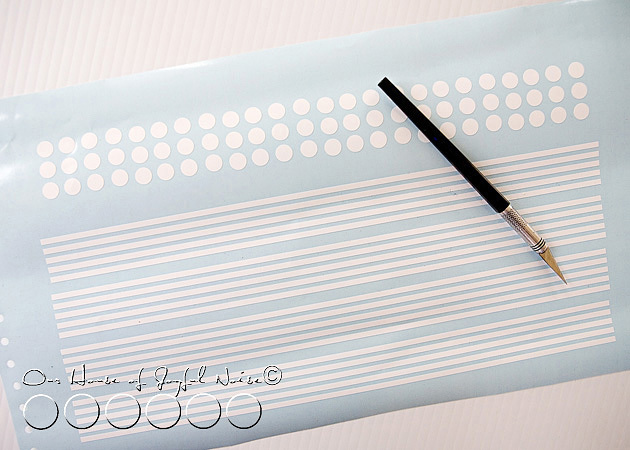 It was a pleasant surprise to realize they were sticker paper too! That was going to work out nicely, for adding the centers on flowers, etc. And if there was no need for sticky paper, I just left the backside on.But you can use any colored card-stock, that comes in sheets, as well. Alright, so I didn’t take photos of every step. That’s needless really. 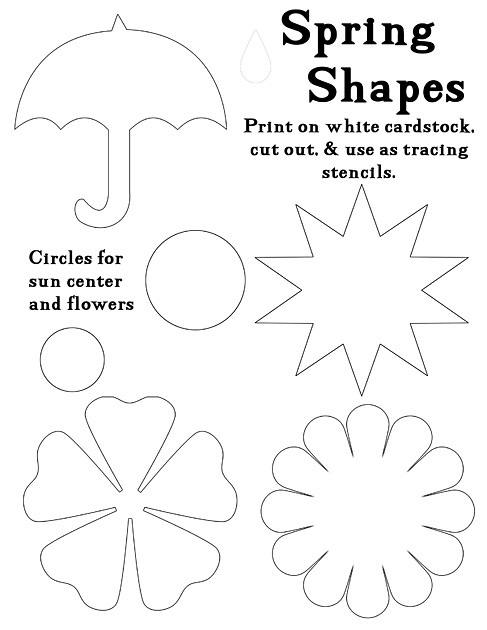 But the simple directions are, that I cut my Spring Shapes out of the white card-stock I printed them on, and used them as stencils on the little square card-stock pieces. 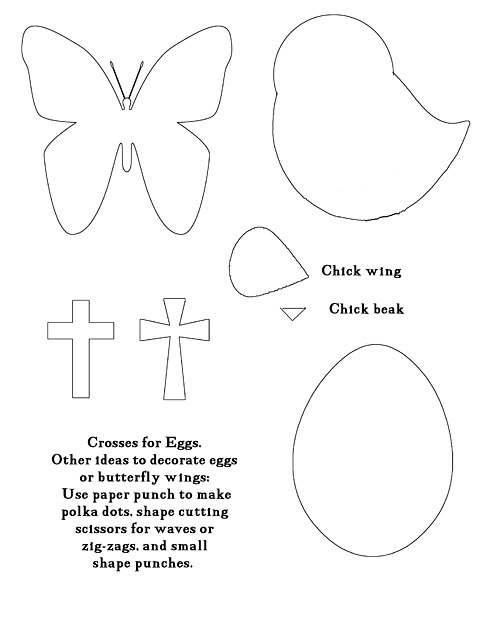 There was a whole lot of tracing stencils, and cutting out, going on. Then it was sticking or gluing pieces together, to make little happy die-cuts of art. I have to tell you, as crafty as I am, I HATE CUTTING STUFF OUT!! With scissors. Thankfully, my kids love it! It’s great practice for scissors-skills for them. 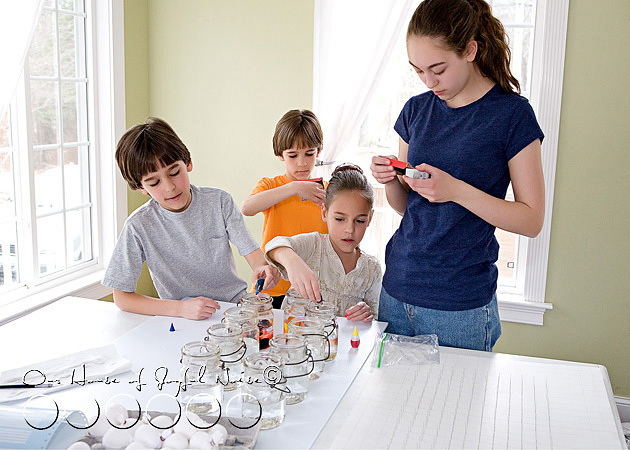 I did do a lot of the cutting for this project, but they enjoyed helping when ever and wherever they could. I was thankful for every bit. 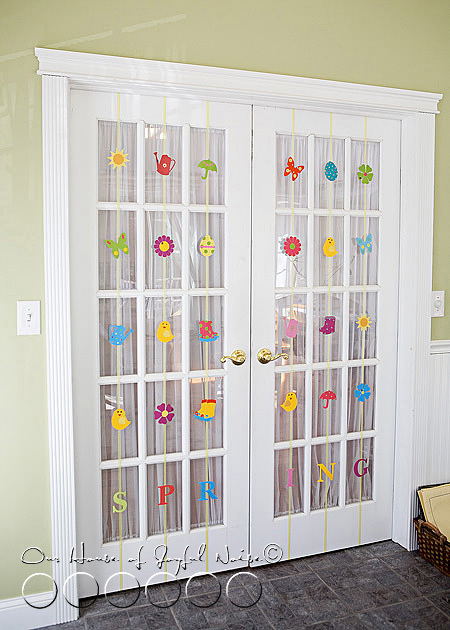 Using almost an entire roll of ribbon for each row of windows top to bottom, attach one end on top of the door, and center of the row. Run it all the way down, to attach to the bottom of the door, again keeping it center. 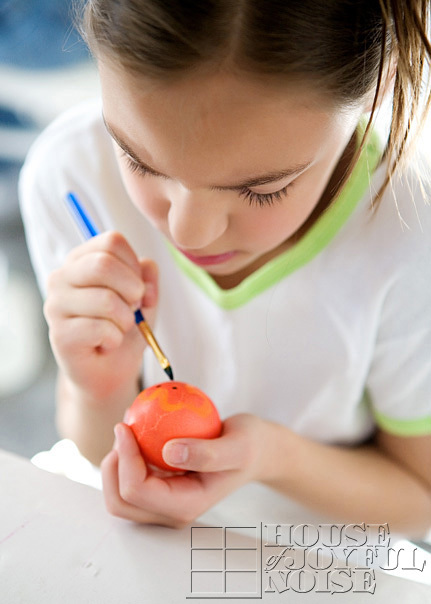 Cut off any excess before attaching. We use a tack at the top, and glue on the bottom. 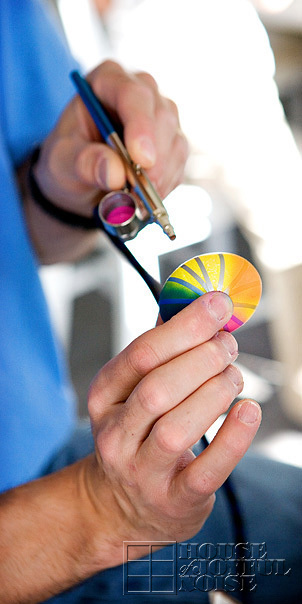 Then just dab a little hot glue onto the center of each die-cut one at a time, and apply it to the ribbon in the center of each window. Here are my doors, all done!! 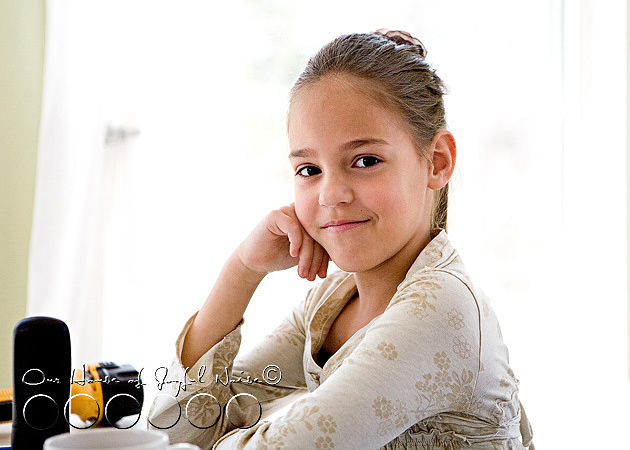 CUTE, or WHAT?? Such a simple project, but just a lot of cutting. 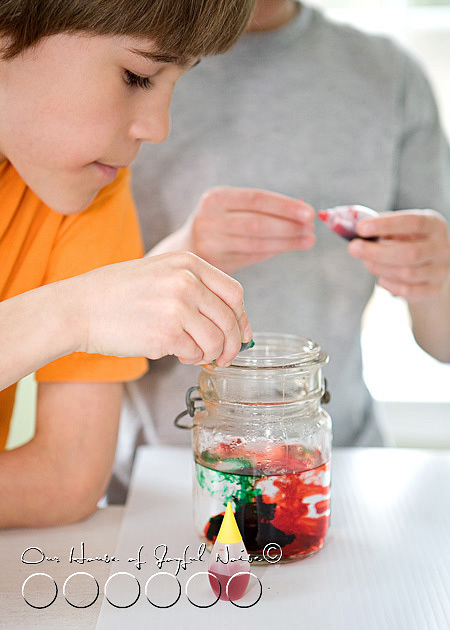 This was a craft for the kids and I to do together, from the get-go, so I knew which part I’d be letting them do some of! Hopefully you have a few of those happy-cutters, too. 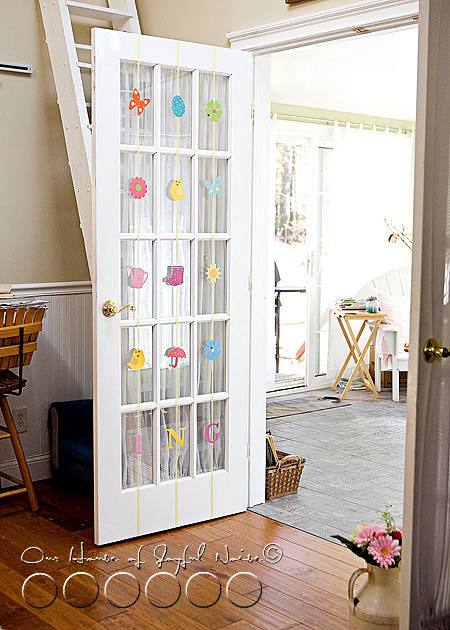 You know, you don’t have to have French doors, to do this project!! 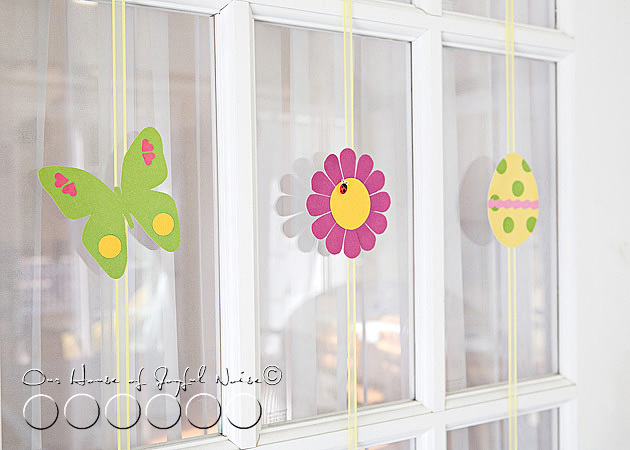 You can do the same thing, in grid picture windows, or make horizontal strands as a Spring-themed decorative garland! Dang if that doesn’t make me really happy inside, too. 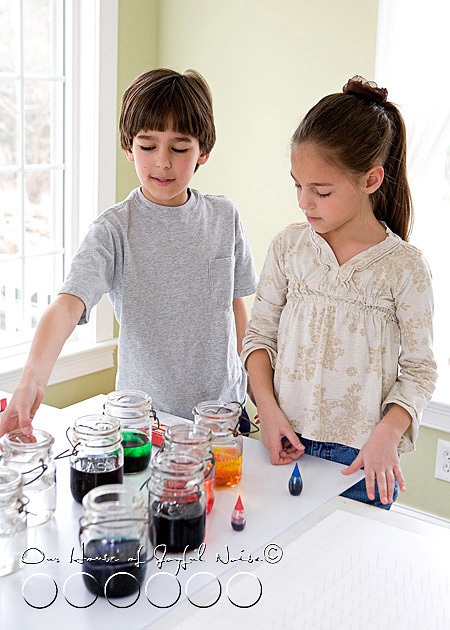 I love doing projects with my kids. It’s so rewarding, for all of us, in so many ways. 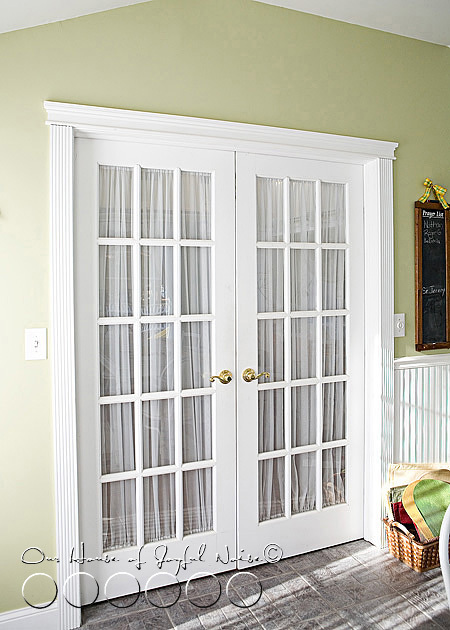 Just so you know….our French doors are rarely closed like that. Our 4 season sunroom, is open to the rest of the house most all of the time. It’s surely a cheery passage-way now. 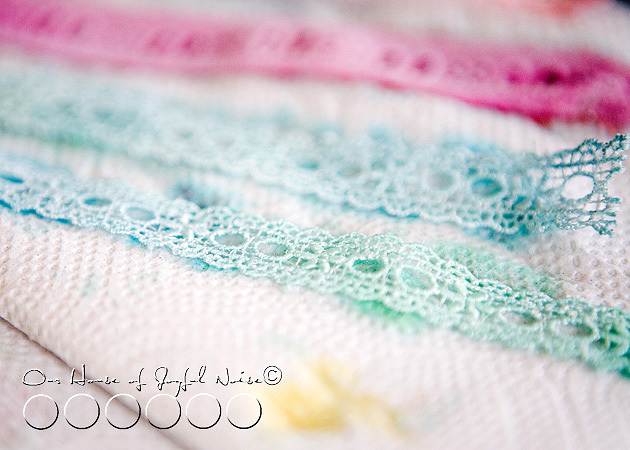 When spring turns to summer, I’ll be taking these strands down, but keeping them to use again next year, just as I did the winter ones! 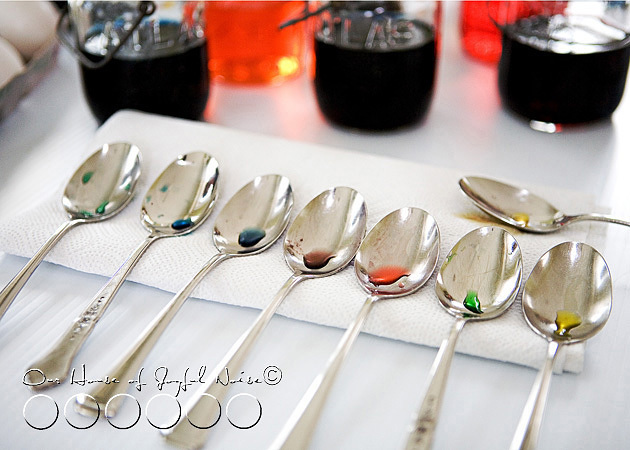 They are easily re-usable, for at least a few years if not more, if they are stored nicely. 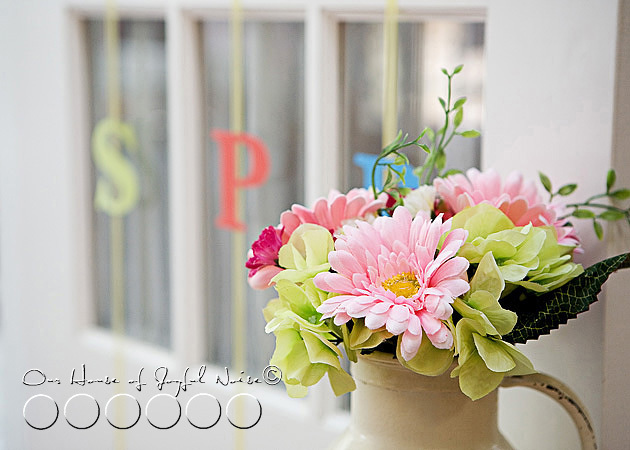 On a side note….I do struggle with displaying fake flowers in my house. I prefer fresh of course. But it’s just not budget smart, year round. Unless I can cut fresh flowers from outdoors now and then, and I do when I can. But in between….fake it is. I just like to have some especially, in my old milk jug. So just for fun, I decided to design a little collage, to show you some of the pieces a little closer up. 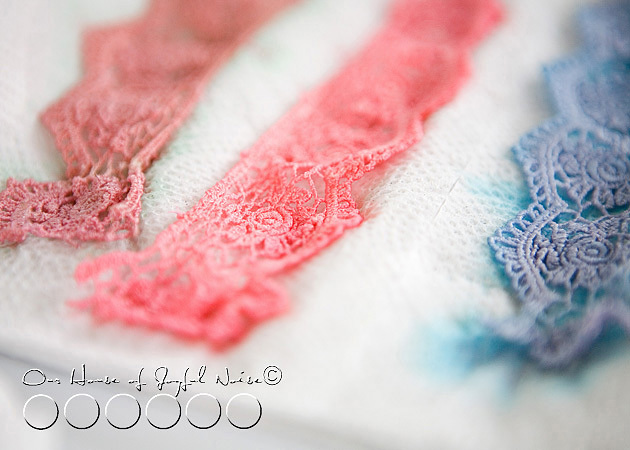 Naturally, when posting photos on a blog, some detail is lost. But it’s still a closer look. 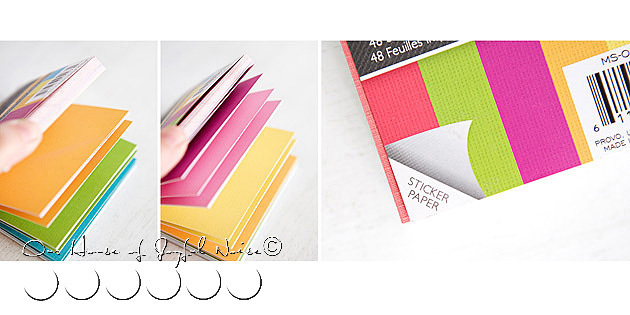 The collage of these mini-photos, is of course, of little paper art. 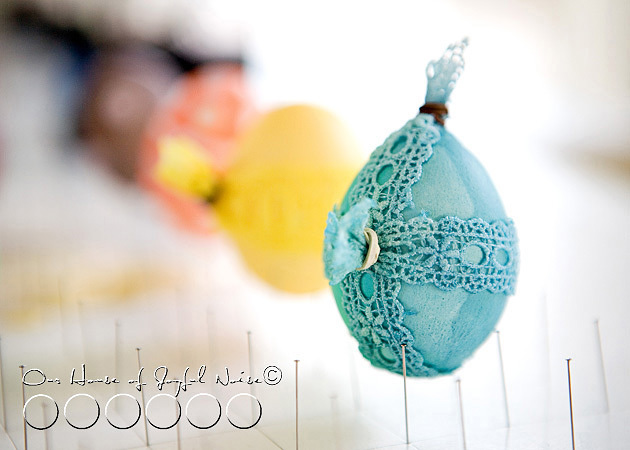 But how cute would it look on display, near your Easter tree, in your kitchen, or in a little girl’s room! 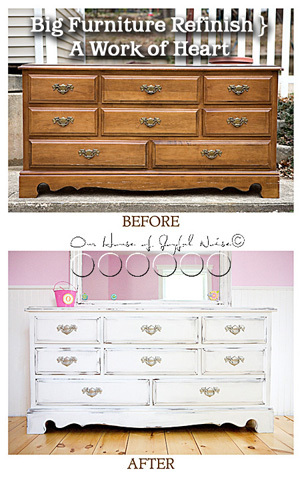 It would look cute anywhere! 2.) 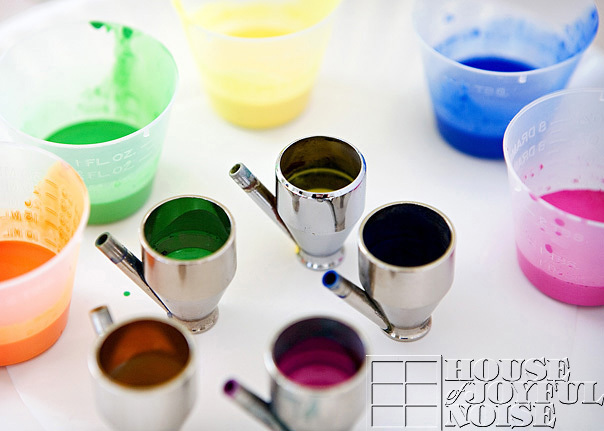 Leave a comment below, saying anything you wish, or letting us know you are now following our blog! I’ll do a drawing from the comments by the close of the week! I hope those links work for you anyway If not just email me, and I will send them to you. I did free-hand draw a few on my own, that are not on the sheets, but most are here. You can add idea of your own too. Just keep the shapes simple.